Italy is the world’s largest wine producer by volume. A tremendous variety of red, white and sparkling wines is made from the Alps down to Sicily. Blessed with better climatic stability than France, it is claimed that the quality of Italian wines varies less from year to year so vintage is not such an issue. The simplest table wine will be labelled “Vino da Tavola” (V.D.T.). This is a wine whose origin is not specified or classified. D.O.C. wines (“Denominazione di Origine Controllata”) are wines made from certain grapes which have been certified as grown in a specific viticultural area. 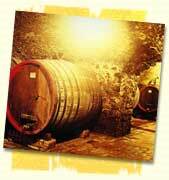 A wine which has been aged for a longer period of time in the barrel before bottling is called “Riserva”. D.O.C.G. wines (“Denominazione di Origine Controllata e Garantita”) . This highly-prized certification is only awarded to wines which have passed more stringent testing and controls. The methods of cultivation and production are rigorously controlled and the resulting DOCG seal provides a guarantee of quality. Home of Barolo, Barbaresco, Barbera, Gattinara (reds) and the famous sparkling white – Asti Spumante. Around Verona and the Lakes you will find Valipolicella and Bardolino (reds) and the white Soave. In the Venice area there is Prosecco which can be dry or sweet, sparking or still. Emilia Romagna Lambrusco – a light white fizzy wine best drunk chilled in the summer! Chianti, Brunello di Montalcino, Vino Nobile di Montepulciano (reds). Brunello is a particularly fine wine which can be kept for 50 years before drinking! Umbria Orvieto (white) from the town of the same name. Verdicchio – a very pale dry white wine from near Ancona. From the hills around Rome, Frascati, Marino and Velletri (whites). The area around Naples is home to the strong white Lacrima Christi del Vesuvio.